The Future of Music was first published under the title TERPANDER or Music and the Future in 1926 in a series ""To-day and Tomorrow"" (Kegan Paul, Trench, Trubner & Co. Ltd.). It has been reset and is reissued as a tribute to a great British musician, Edward J. Dent. 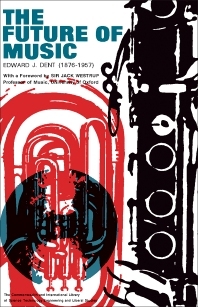 Dent was fifty years old when he wrote this little book the future of music. Though his book is concerned with twentieth-century music he scarcely mentions any living composer by name. He is dealing primarily with taste and with our varied reactions to the music of the past and the present. The past is important, because it is both a key and an obstacle to our appreciation of the present. For this reason Dent includes a masterly summary of the history of music, from which his own preferences are almost entirely excluded; and to this is added a miniature essay on aesthetics which can be read with profit even by those who have no special interest in music.